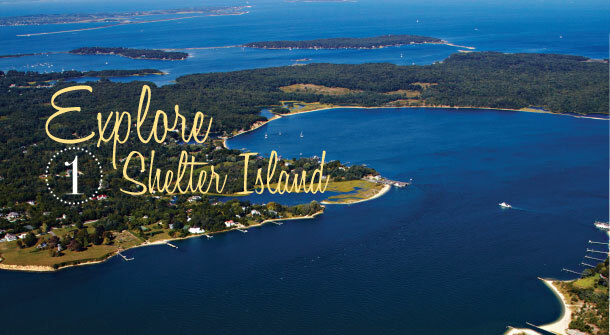 We’ve been looking for you: The last Long Islander to visit Shelter Island. Admit it, when people reference the punctuation mark set between our forks, you twinge a bit, privately scolding yourself for never getting there. But we know it’s because you’re not sure why you should go. Well, for one thing, it’s a time capsule. No matter what season you go, things are slower, sweeter. It’s the kind of place you can rent a smart car (coming soon) or a bike and see the sights in a day. Or pack the gear and camp out for the weekend. The 8,000-acre island holds some of the last vestiges of unspoiled nature near our sandbar—there are more deer and wildlife than you can shake a stick at. It’s a woodsy retreat, a beach community and a small town village all wrapped in one. Curvy shorelines to explore via canoe or kayak, bike and nature trails, restaurants and marinas all mingle free from highway sounds. Several inns and B&Bs share the island with mainstay hotels like The Pridwin and Sunset Beach. Boaters tie up for the weekend at Coecles Harbor Marina and diners are treated to fresh fish caught by the owner himself at Clark’s Fish House. And the best part is it’s so close, it’s the perfect last minute getaway. This is your year. How many times have you sat around with friends over a bottle of wine wondering if you could do better? You muse about how great it would be to own your own vineyard, work the land, plant the seedlings and tend to the grapes. You joke about that old Lucy episode. And you dream of how perfect your wine would be. Then you realize that your only-slightly-better-than-average suburban plot wouldn’t yield very many grapes and you go back to drinking. 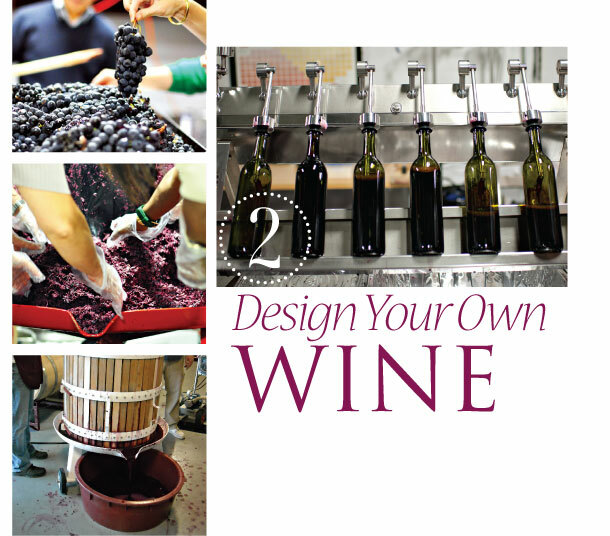 The vineyard may not be feasible but creating your own vintage is. wineUdesign is a vinophile’s superhero. They help procure the grapes for your juice and guide you through winemaking school over an eleven-month period. You may not be stomping the grapes à la Lucy, but this is your chance to get your hands a little dirty and you’ll learn the process and get the goods (equipment, storage and a label). Cheers! You love food. And you live on Long Island, so chances are you really love Italian food. 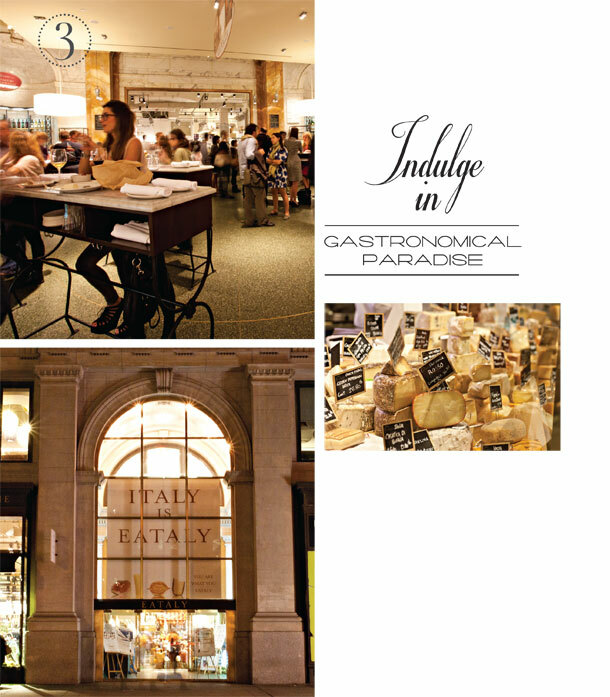 Get to the heart of the matter in Manhattan’s Flatiron District—Mario Batali’s heart known as Eataly. 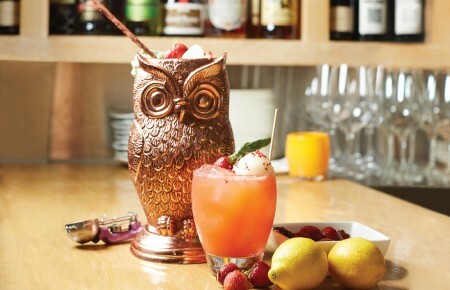 The epicurean bonanza goes on seven days a week in a 50,000-square-foot Italian food emporium stocked with a glut of goodies you’ll normally only find by taking a flight to the old country. What better way to slow time down than to spend an entire day browsing the staples of a life well eaten? This is the antidote to breakfasts in the car and dinners standing at cocktail parties, to say the least. 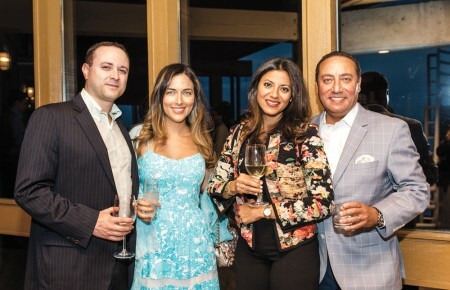 It’s about connecting with food, about feeding your bella vita. You’ve heard about the 90 different types of olive oil (aka: Italian “fruit juice”), delicacies and higher-fat European butter and thought: I have to go. Joe has been there…he keeps talking about it. I have to get there… It’s the first part of a trip to the city or it is the city trip. When you’re done filling the cupboards, restaurants await to quell your appetite. Put this magazine down and go now. TIP: Enter through the 23rd Street entrance; the one on 5th Avenue leads to a bottleneck at the coffee bar. 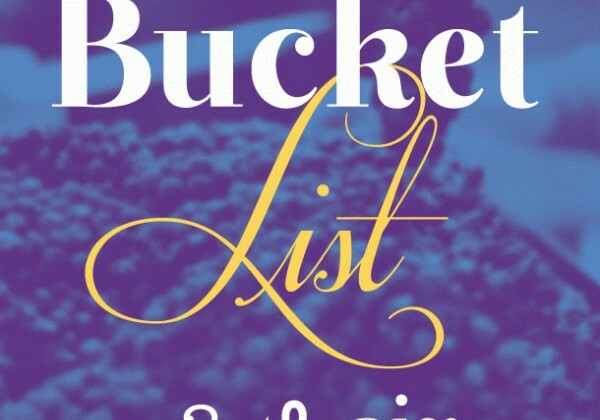 Attention adrenaline junkies! This is your thing… “You go inside the cage. The cage goes in the water. You go in the water. Shark’s in the water. 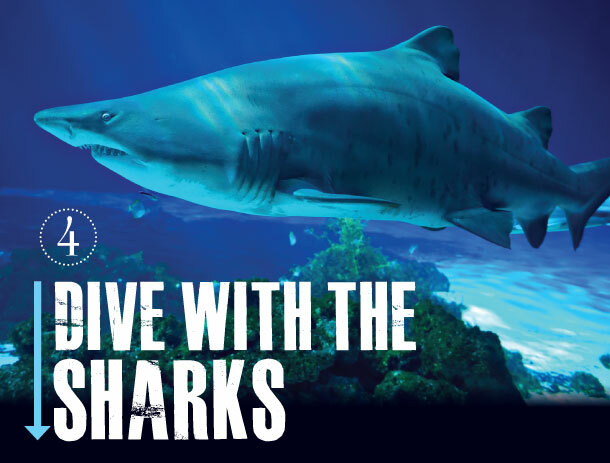 Our shark.” Riverhead’s Long Island Aquarium gives you the chance to (finally) come eye to eye with circling sharks on their turf. Their “Jaws” is a 300-pound loggerhead sea turtle, but the nurse sharks that patrol the sandy bottom and the handful of sand tiger sharks (up to ten feet long) are reminiscent enough of Jaws to make you hum duh-duh, duh-duh. They swim alongside massive Queensland groupers, slithering moray eels, schools of smaller fish and you, all inside the massive Lost City of Atlantis sunken ruins saltwater tank. A wetsuit keeps you warm and SCUBA gear keeps you breathing (no certification required). Just remember: No feeding the sharks, keep those hands inside the cage. Bragging rights (and Facebook pics) sold separately. Ever hear the term “anywhere the wind blows you” and you lighten at the sense of freedom? Maybe it’s time for a new water sport. You’ve tried waterskiing on our bays, windsurfing in the sound and boogie boarding in the ocean. Maybe you’ve even claimed a few bruises jet skiing or surfing. 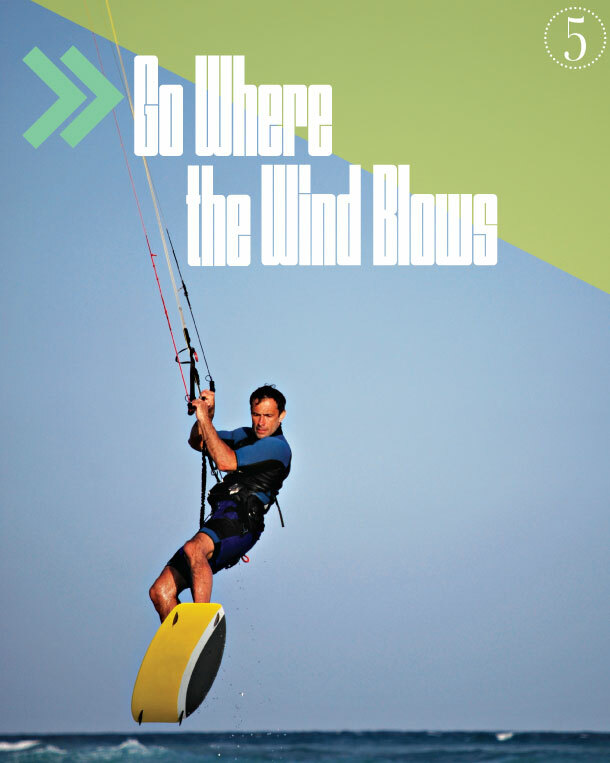 It’s now time to take that next step on the evolutionary ladder: Kiteboarding. You’ve seen it once or twice and wistfully thought, “Coooool. If only…” It’s an extreme combination of all of those other things, yet also its own thing. A touchy truce between wind, water, board and kite—and you’re the peacemaker. Standing on the small board, you launch a kite downwind. When she clicks, she gives you a pull and there you go—the freeride. You edge, you turn, you toy with the wind. In time, you get real free and catch the big air off waves, feet above the horizon. Yeah man, anywhere the wind blows you. Start by learning how to read the winds, old school style. NY Kite Center in Amityville will help. They’ll get you schooled, outfitted and versed in safety (it is an extreme sport, after all). You’ll be talking about wind windows and vert in no time. You want to do something. You want to give back. The aftermath of Sandy was no afterschool special for you. Where to start? How to help? What to do? It’s a part of life—helping a neighbor shovel snow or donating clothes. But you’re ready to connect and you want to commit. Island Harvest is a favorite of this magazine’s. They helped distribute 11 million pounds of food and necessities last year. What does that mean? About 1 in 10 Long Islanders relies on the food that passes through their rescue banks. You could deliver food once a week or once a month directly to those who need it. You could relay goods from pick up points to pantries. 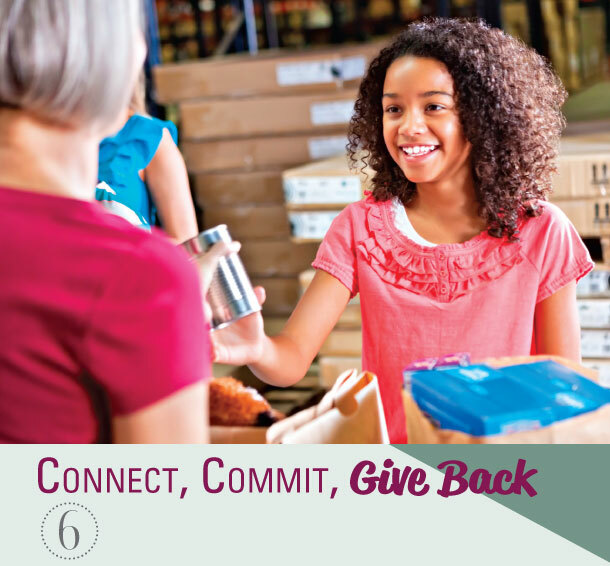 You could help at events, assist in the warehouse and at the office, or you could be in the field, expanding the network of where they collect the food and also where it goes. How do you know what you could do? You call. You tell them how much time you have, per week or per month. You tell them where you live and where you work. You tell them what you’re good at and what you’re not. They fill in the blanks. And then you help, 1 in 10 neighbors, every time you do something. You contribute and you feel better, every day.